Lobelia is an analgesic, antispasmodic, astringent, and decongestant. LOBELIA (Lobelia inflata) This herb is commonly used both externally and internally to relax all spasms. In small doses, it is used for lung congestion; and in large doses, it acts as a powerful emetic. A few drops of the tincture can be placed in the ear to relieve earaches. 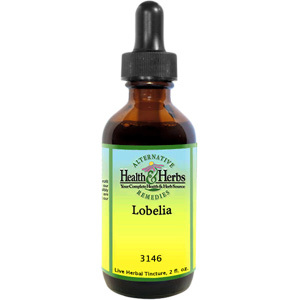 Lobelia is often used in liniments and poultices (may be mixed with Cayenne and Myrrh) to reduce swelling in sprains and strained ligaments and for congestion in the muscles. It may be used with Catnip in an enema for fevers and infections. Other uses: softens and makes fuller the pulse rate during inflammation and fever; reduces palpitations of the heart; for fever and pneumonia; for congestion, asthma, meningitis, pleurisy, hepatitis, peritonitis, nephritis; for digestion. WARNING: Large doses will cause vomiting. Lobelia, R/O Water, 12% Alcohol. Lobelia is shipped in a discrete, unmarked package. Orders are processed immediately and usually take about 3 to 5 working days to be received. Any information received is used only for order processing and shipping purposes. Your information, such as e-mail address, will never be disclosed to a third party.